First published in Steven's Window column, The National newspaper. Friday 16th October 2009. Photo credits: Keisiva Darius. To reclaim our identities, histories, languages, and ways of knowing we need to return to our communities. The challenge to develop community learning centers or information centers are insurmountable to many community based organizations, NGOs, literacy workers, women’s groups, church groups, and youth groups. Some of these challenges are financial, others are ideological, and still many are necessitated by the inherent conflicts between introduced and indigenous cultures, between western and non western dilemmas, and between different generations. Such challenges remain entrenched in many Papua Guinean communities. Working with many community based organizations, NGOs, and literacy workers I have come to appreciate the wonderful and resourceful individuals in many of our rural communities sweating their guts out just to give their people the opportunity to have equal access and partnership in national development. The support of the community and the network these individuals have with each other is perhaps the only strength many of the dedicated individuals have. The leaders in many of these community based organizations are passionate, dedicated, and open-minded individuals anyone would ever meet. They are people who inspire and lead their communities in various activities organized in their communities. I was given the honour to officiate the opening of Gadsup Indigenous Knowledge and Communication Centre in the Aiyura valley of Kainantu. The centre is known as Ayugham Bhana or the hausman, built on the original village site on a hillside overlooking the Aiyura valley. The leader of this project is Labu Pungkano and is supported by his Ward councillor, Alex Paimako, Pastor Yana, and the whole community. About 3,000 people turned up for the official opening and celebration of the bhana or hausman with a lavished mumu feast. The hausman concept is useful as a physical space to coordinate education and training of the young men in reclaiming their positive traditional values, histories, identities, and languages. Many of the young people are alienated by the modern system. Many are into drugs, alcohol, and have no respect for elders and traditions. Many school leavers in the village have no sense of direction. Crime and violence have arrived in the village communities through the complete break down of tradition and absence of traditional leadership. At the time of our visit many people in the Aiyura and Kainantu are were living in fear of the ongoing tribal fights and violence. As a conceptual framework the hausman can be used to re-insert culture back into the lives of many of the young people. The elders of the hausman will use the bhana to provide leadership, training, cultural knowledge, and positive values to the younger members. The hausman becomes the site of knowledge production where important valuable information on life are produced and disseminated. 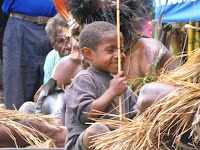 The hausman serves as the institution of knowledge production and information communication in many PNG communities. The Ayugham Bhana will become the cultural space for teaching of the local language to the younger generation. Many in the community felt that their languages are gradually fading out that many young people are no longer speaking their Tokples. The first rule of the Bhana is that no Tokpisin or English are allowed in the hausman. The language of business and learning in the Bhana is the Gadsup language. The second specific need of the Ayugham Bhana is the cultural re-education of the youths in the Aiyura valley community. The hausman will have adult education programs, literacy programs, and media literacy programs led by the a committee made up of LLG Ward Council, youth leaders, women’s groups, church elders, and village elders. This committee will coordinate the development and sustainability of the hausman. The plan is also to build a hausmeri for the women of the valley. The hausman or the hausmeri will become the institutions of cultural re-education in the rural communities of Aiyura valley. Given the honour to open the Ayugham Bhana in the Aiyura valley was a great humbling experience for me. Returning to the Aiyura valley brought home a lot of memories of my teen years as a student at the Aiyura National High School between 1982 and 1983. I felt honored to officiate the opening of the hausman as a token of my appreciation of Aiyura’s part in my life. To mark this important occasion Mr. Nimo Kama, one of their leading sons and I cut the ribbon across the door to the hausman. In the hausman I lit the fire at the fireplace named in my honour –a symbolic gesture suggesting the importance keeping the cultural re-education alive in this community. Mr. Nimo Kama, Executive Director of the Media Council of PNG and Ms. Nancy Manukoro Tomwepa, a teacher at Aiyura National High School—two of the elite members from the Aiyura valley are helping their communities to reclaim their traditions, institutions, and processes of knowledge transfer and communication. They are serving as the bridge between tradition and modernity for their people. As educated members of their communities they are working in close consultations with their communities to find ways of cultural re-education founded on valuable traditional knowledge systems. I felt privileged to have been part of their journey as their former lecturer during their university years. The community learning centers are only sustainable and effective with support from government agencies, relevant institutions, and organizations, and Papua New Guineans who care about the survival of indigenous knowledge and values that are important to our people. Without external support many of these centres can fall apart quickly. All centers need funding to carry out their programs and activities. Without financial resources many of these centers will eventually fold up. Centers supported through various grants and institutional partnerships are more successful than those without any form of support. In a basket of community learning centers we know that some are more successful than others. I think the best approach is to assist each community centre and organizations is to develop management and organizations programs, and work with them to reach achievable goals set by the center.